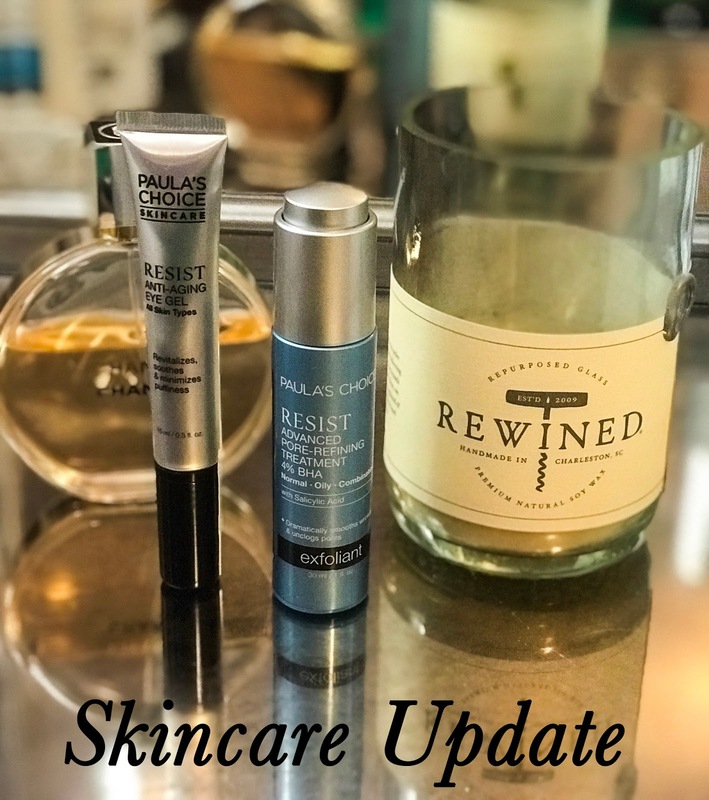 I've talked about my skincare routine before - morning post here, and evening post here - but I've been using two new products that I wanted to talk about: Paula's Choice RESIST Advanced Pore-Refining Treatment 4% BHA and Paula's Choice RESIST Anti-Aging Eye Gel. I've been wanting to add an eye gel to my routine for a while now. It's the first part of the face where you really notice tiny wrinkles - smile lines! And in the winter especially, the skin around my eyes can tend to get a bit dry, especially since I use gentle exfoliation twice a day. This has been a great, lightweight gel - it absorbs really quickly, and is light enough for my skin. I love the cooling metal applicator tip, too! The other product is kind of a combination one - it's a leave-on exfoliant, but has antioxidants like a serum would, as well. I'm using this in place of my other nighttime serum, for now - I've been having some breakouts, and felt like I needed a little extra power in dealing with them! I absolutely love the texture of this serum - it spreads really nicely, and it dries down well, too. The dispenser is great - you press down on the button on the lid, and it draws the serum into the little dropper attached to the lid. I love how easy it is to press the button to dispense the liquid - it takes no strength at all! Both of these products have been the perfect new additions to my routine, but I'd love to hear if there are any other new products you can recommend to me! Informative post. Amazing range of products to cover aging and add an even tone to your skin. Going out with those wrinkles under your eyes gives away a very depressing look. Try revitol anti-aging cream and find no more wrinkles. The main ingredients in this cream will help reduce aging.